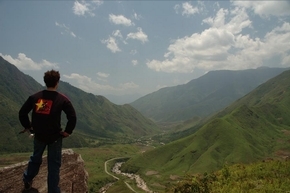 The landscape of Vietnam's mountains is unlike any other I've seen before. Every few corners you have a 180+ degree view of the mountains and valleys, always covered with lush, vibrant green vegetation. In addition to the natural beauty, we would see people working the fields by hand or with water buffalo, children riding bicycles or walking to school, traditional thatched-roof houses, terraced rice paddies, women in traditional clothing, the list goes on.People in the countryside seemed very friendly, but sometimes intimidated by our group of 6 bikers. The main road that we were on was only paved in the past year, so I don't think that they have had much contact with foreigners.